With Milbeaut's image processing technology for capturing the best moment, we have means to reduce shakes and realize stabilized video recordings in action scenes such as bicycles and motorbikes. 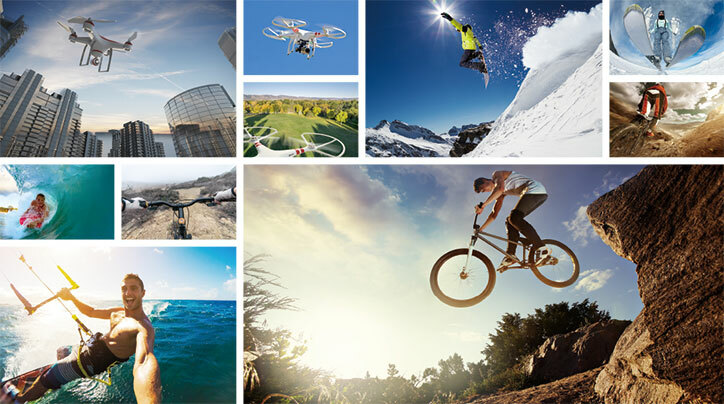 We support high quality image in active scenes on devices such as drone, drive recorder, and action cameras, providing perfect solutions for the latest trend market. Mounted with high-performance EIS suited for drone, action camera, drive recorders, etc., our system allows user to capture stable shots in action scenes. With other features including slow motion capture, suited for golf swing scenes, auto object-tracking feature「Follow me/Follow you」, Video HDR, and Haze Removal, we support high quality shooting in various scenes. 360 degree video using fish-eye lens can be converted in real time by applying lens distortion correction to the image by parts. Video can also be viewed in panorama by setting larger horizontal size to cutout. The EIS feature contributes to capturing beautiful images in action scenes. Provides smooth and stable images for action camera and drive recorders, in which the camera body itself is in motion. 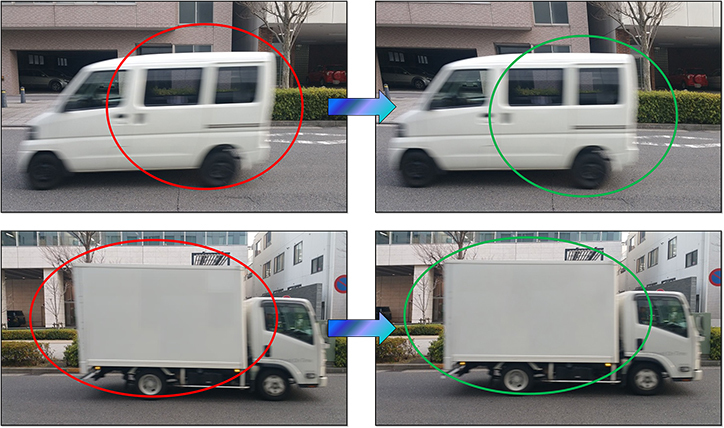 Detect and correct partial distortion caused by fast-moving objects. Can be combined with EIS to provide more stable video recordings. Creates HDR image by alternately capturing (60 fps) short exposure and normal exposure images in full HD size (1920x1080) and merging them into one image internally. 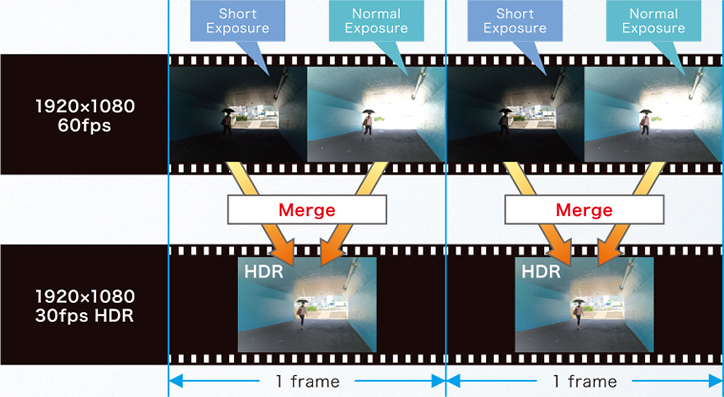 HDR reduces over exposure / under exposure in backlight, high contrast, or night scenes, bringing out detailed and vivid video images. Since it supports high speed, processing every frame, the Video HDR is very effective for drone and drive recorder cameras, where the camera is mostly moving around. Under environment with poor visibility, such as rain or snow, Haze Removal can clear out the haze without removing the rain/snow itself. Also, rain droplets can be detected when falling upon camera, giving the camera an alert/trigger feature when it is wet or has vision troubles. 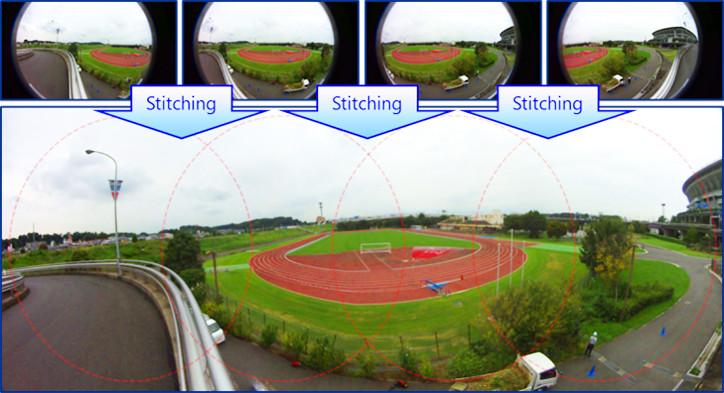 It's possible to stitch the video captured from at most 4 cameras (Max : 4K 60fps). When using a fish-eye lens, it's possible to capture a video by the wider field angle by correcting the distortion in real time. High frame rate video capture is possible. The captured video can be enjoyed as slow motion video using an application that can change the playback frame rate.